Moles are not your lawn's best friend. The problem with moles is that their impact on your lawn and garden isn't typical of most garden enemies. Moles tend to nosh on earthworms, grubs, and other bugs. They don't eat your plants, but they do cause damage to the surface and underground (tunnels and holes dug into the law), according to Greenview. Because moles live underground, you're not going to catch them in the act. If they do come up, they can be a bit hard to spot. They are only about 6-inches long and are generally gray or black. Even though you can't see them, you will be able to see the damage they cause. Because moles are a common garden pest, plenty of solutions for getting rid of these pesky critters have cropped up on the internet. Some of them are legit, and others... well, not so much. Chase moles away with gum: The video below shows one man using gum to get rid of moles. The idea is to place pieces fruit flavored gum into mole holes. The mole will think the chewing gum is a grub and choke on it. Colonial Pest, claims that while there are plenty of people willing to hand out this information, it doesn't actually work. Moles are not likely to be tricked enough by the gum to actually eat it. Grub control: While the logic behind this one is actually sound, it's not nearly as effective as you'd expect. In theory, you get rid of grubs from your yard (it's what they like to eat) and they move elsewhere to find food. 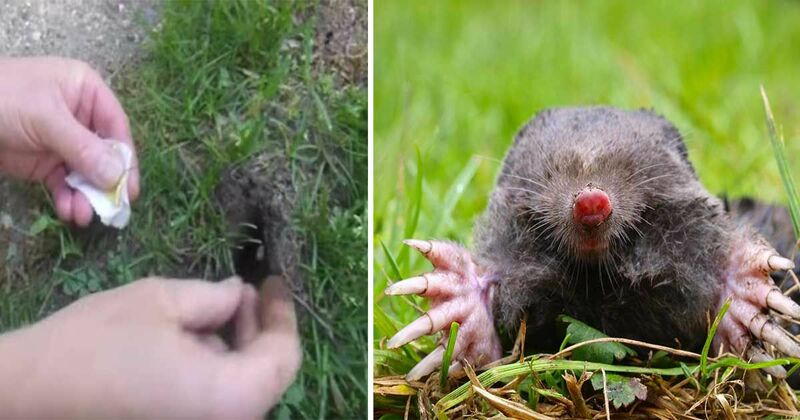 The problem is that moles eat earthworms too, so your repellent may not actually reduce their food supply by much, according to Mole Catchers. While this method isn't full proof, it may reduce some mole activity. Creating barriers: Planet Natural recommends digging a whole that's 6-inches wide and two feet deep. Fill with wire or rocks to prevent burrowing near your garden. This won't keep moles out of your entire yard, but it will keep them away from your flowers or your veggies. Ultrasonic Devices: Another option is to try a sonic machine that produces an underground pulse. The machine won't bother your pets, but the noise will likely irritate moles and other underground pests, according to Planet Natural. Trap the moles: To eliminate your immediate problem, you can trap the moles and have them taken away. Consider hiring a professional or you can purchase a mole trap at a local garden store. Do you have mole problems? Have you tried any of these remedies? Share your thoughts in the comments below.